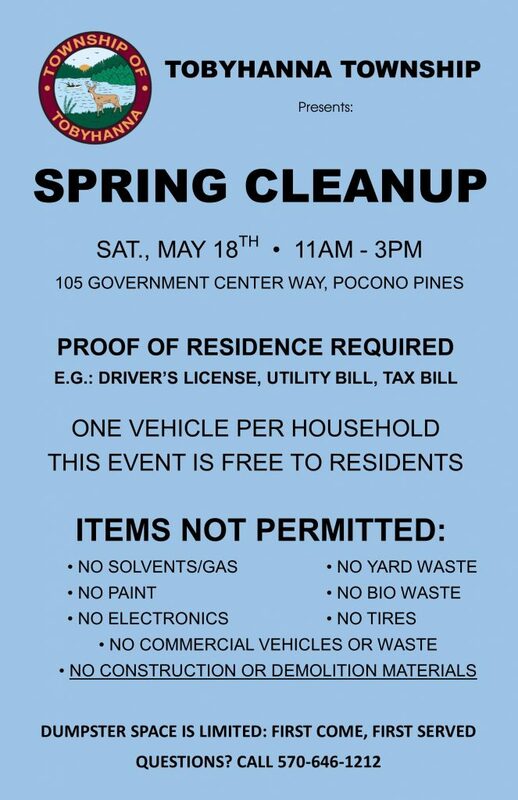 Residents of the township may utilize dumpsters provided by the township for free. Proof of residency is required, and may be in the form of a driver's license, utility bill, tax bill, etc. One vehicle per household. 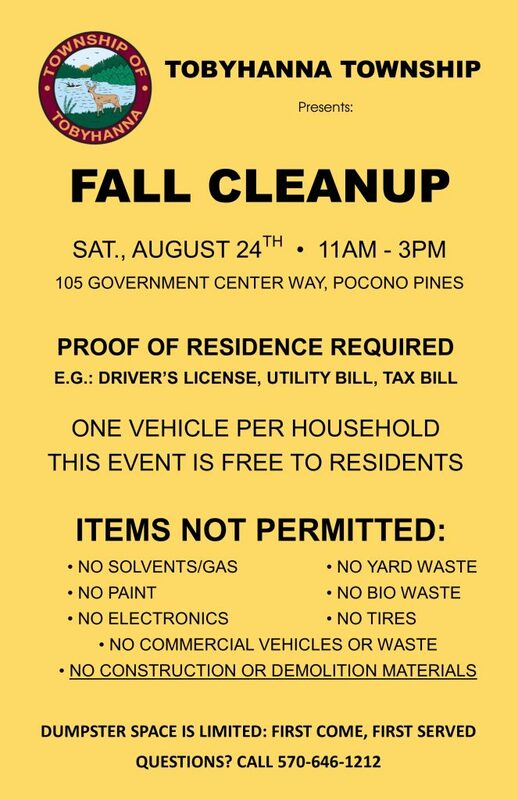 If you have further questions about what will or will not be accepted, please call Panther Waste at 570-646-5178. Celebrate the nation’s independence with music performed by one of the nation’s elite military bands. Admission is free, but seating is limited. If you have any questions about this event, please call 570-355-2224. Residents and visitors come together for a day outdoors with live music, vendors, free bounce attractions, food and more. Admission and parking are free. The festival will conclude with a fireworks display sponsored by Tobyhanna Township Volunteer Fire Company! If you have any questions or are interested in vending at this event, please call 570-355-2224. Residents and visitors come together to celebrate our emergency service providers. This event is free to attend. Come hungry, because dinner is on us. There will be cake! Residents and visitors come together for a day outdoors with live music, vendors, hayrides, and absolutely adorable alpacas. The free pumpkin patch was so popular last year that we're doubling the number of available pumpkins to 600! Once your child has selected their favorite, make sure to stop by the decorating tables and let their inner artist shine.